Preprinted frame accents the title page. Swing clip slides open and closed easily on a single rivet to secure your pages. Durable polypropylene plastic keeps your report looking sharp. Each cover holds 25 pages. 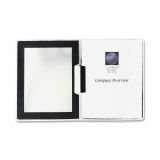 Avery Flexi-View Swing Clip Clear Front Report Folder - Prepare reports that are ready to swing into action and impress your boss or instructor. 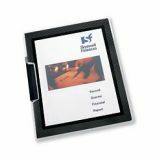 The Flexi-View™ Report Cover binds your report in flexible, durable plastic that keeps your pages looking neat and presentable. A colorful preprinted border on the front cover frames a translucent window designed to show off your customized title page. Predesigned templates and software at avery.com provide easy customization of title pages. The convenient swing clip on the spine opens and closes easily, holding up to 25 pages to ensure that your report stays securely bound and ready to wow.